The Huawei Ascend P6 smartphone may be the next Android device to forgo its custom UI, giving users the option of a 'Nexus-ized' Google Edition. Speaking to Pocket-lint, Kevin Ho, president of the Chinese manufacturer's handset product division, said Huawei has entered talks with Google over a version of the P6 with the pure Android experience. 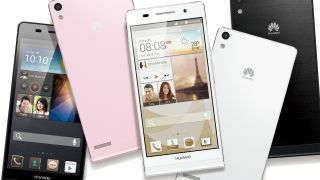 "We are working with Google to analyse the possibility of bringing out a Huawei Ascend P6 with Google Edition," he told the site. The standard version of the 4.7-inch P6, which was recently-crowned the world's thinnest smartphone, runs Huawei's Emotion UI. If the thought of the 6.18mm-thin P6 running vanilla Android intrigues you, temper your excitement with knowledge that company CEO Richard Wu said during the phone's June 18 reveal that the Nexus experience won't land on a device made by the firm. Wu said then that Emotion has "hundreds of improvements" over Android's user experience. Someone seemingly missed an email or conference on the Nexus issue, but we'll keep an eye out for further developments either way. The clamour for Google Editions of flagship Android devices began last month at Google I/O when the company announced a Samsung Galaxy S4 with the same UI that appears on branded Nexus devices. HTC soon followed with a HTC One Google Edition after initially denying such a version was in the works, so perhaps Huawei is following suit with its messaging. Both the Nexus HTC One and S4 are only on sale in the U.S. at present. Custom skins like Samsung's TouchWiz and HTC's Sense have long divided opinion among Android fans, with some choosing to root their devices just to access raw Android. The growth of Google Editions, something the search and mobile giant certainly supports as it attempts to reel in Android fragmentation, means users may no longer have to tamper with the device to avoid these homegrown skins. Speaking of Android versions, version 4.3 has reportedly been spotted running on a Galaxy S4 handset.